If you happen to be a water baby, then summers are the most awaited time of the year – you get to swim and play around in water all day long. However, all the fun and frolic can often leave you with bug bites, clogged ears and sometimes the very pesky swimmer’s ear. It is a common occurrence in children and also adults who swim frequently. However, you can get swimmer’s ear even if you don’t swim. Anything that creates dampness, inflammation and irritation in the ear canal can lead to ear infection, specifically swimmer’s ear. Swimmer’s ear is caused by the Streptococcus, Staphylococcus or Pseudomonas types of bacteria. A number of factors can allow the bacteria to grow in the ear canal. Swimming in dirty water: Dirty water can easily transport bacteria into the ear canal. A moist and soggy ear canal also becomes prone to dermatitis. Mechanical damage: Any attempt to clean your ears using pointy objects, cotton buds or fingernails may rupture the delicate tissues of the ear canal and allow bacteria to grow. Chemical irritation: Hair products can get into the ear canal and irritate the delicate tissues and promote infection. Middle ear infection (otitis media): An infection in the middle ear can lead to inflammation in the ear canal. Diabetes: Diabetes increases the alkalinity of the earwax and creates a more hospitable environment for pathogens. Folliculitis: An infected hair follicle within the ear canal can cause an infection. Structural deformity: Some people have narrower ear canals that prevent water from draining out completely. Respiratory infection: A common cold can sometimes lead to an infection in the ear canal. Swimmer’s ear can present itself in both acute and chronic forms. If the infection persists for longer than four weeks or occurs more than four times in a single year, it is considered to be chronic otitis externa. Skin conditions, such as seborrheic dermatitis, eczema or psoriasis. Fungal infection, caused by aspergillosis. Chronic irritation from the use of hearing aids, insertion of cotton swabs, etc. Chronic drainage due to middle ear disease. Itching in and around the ear canal. Redness and swelling in the ear canal. Pus-like and foul-smelling discharge from the ear. Scaly skin around the ear canal. Feeling of fullness in the ear. Muffled hearing or hearing loss. Swollen glands or a sore throat. Keeping your ears clean and dry. Avoid swimming in contaminated water. Do not scratch your ears or insert cotton swabs or any pointed objects in your ears. Use earplugs when going for a swim. Get your ears cleaned periodically by an otolaryngologist if you have itchy, flaky or scaly ears or extensive earwax growth. Note: It is advised to consult your doctor before putting any solution inside your ear as a home treatment. Acute otitis externa can be treated at home by using simple self-care techniques. However, if the symptoms do not go away after a few days of using the home remedies, consult your ear, nose and throat (ENT) specialist for further advice and treatment. 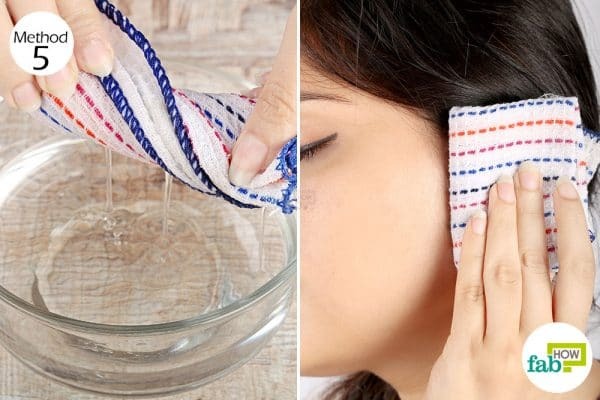 You can try out any of the home remedies given below to get rid of swimmer's ear naturally. A mix of isopropyl alcohol and white vinegar is the most vouched for remedy for swimmer’s ear. The alcohol works as a drying agent, soaking up all the moisture from the ear canal. The white vinegar acts as a disinfectant, killing the bacteria causing the infection. If you’re a regular swimmer, it is advisable to use the solution after every time you swim to prevent any infection from building up. Note: Use isopropyl or rubbing alcohol with 70% to 95% isopropanol content. 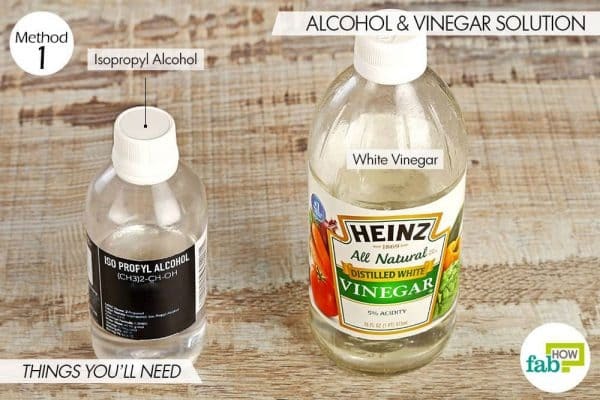 Mix equal quantities of isopropyl or rubbing alcohol and white vinegar in a small bottle. Only make a small batch, as the alcohol will evaporate soon. 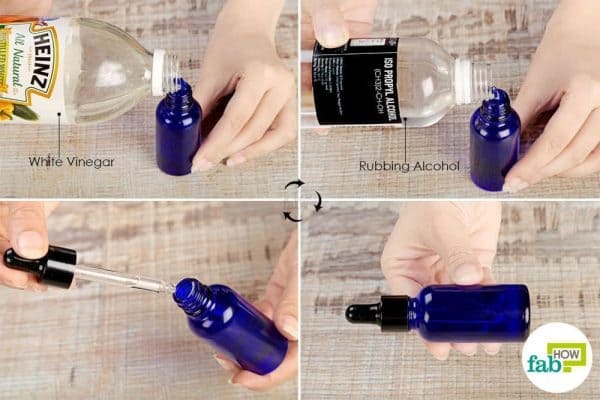 Draw some of the solution into a clean eye dropper. Lie down on your side with the hurting ear facing up and put in a few drops of the solution. Allow the solution to sit in the ear for 3 to 5 minutes. Sit up and allow the excess fluid to drain out. This should give immediate relief from the pain and feeling of fullness in the ear. If the pain persists, use the drops not more than 3 times a day for 2 to 3 days to get rid of swimmer's ear naturally. Hydrogen peroxide is another liquid that works wonders in treating an aching swimmer’s ear. It acts as a powerful disinfectant, clearing out any bacteria that’s in its path. A few inexpensive drops of the solution will take away your pain in no time. Caution: Use 3% hydrogen peroxide only for this remedy, as a higher concentration can damage your ears. 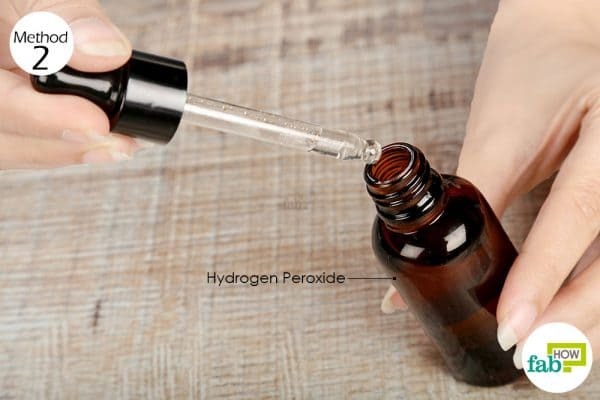 Put 4 or 5 drops of 3% hydrogen peroxide in the affected ear. 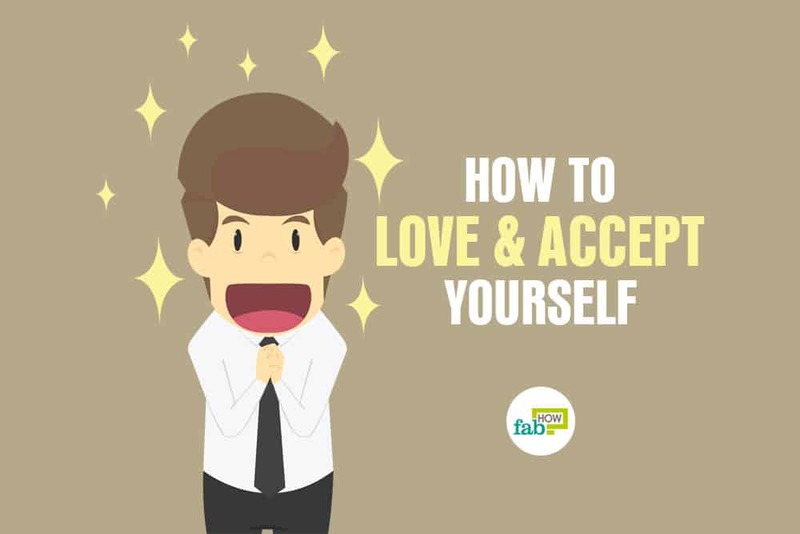 Let it sit for some time, then allow it to drain out by tilting your head downward. Repeat 3 times a day for 3 to 4 days to get rid of swimmer’s ear naturally. Olive oil can be used to treat the dry and flaky skin caused by swimmer’s ear. The oil also acts as a natural antibacterial agent to flush the troubling bacteria out of the ear. Heat 1 tablespoon of olive oil in the microwave for 30 seconds. Take it out and let it sit for a few minutes. Check the temperature of the oil. It should be comfortably warm but not hot. Use a clean eye dropper to put 3 or 4 drops of the warm olive oil in the affected ear. The warmth of the oil will soothe the pain instantly. Let it sit for 5 minutes, then allow the excess oil to drain out onto a cotton ball. Repeat twice daily for 3 to 4 days to get rid of the ear infection completely. 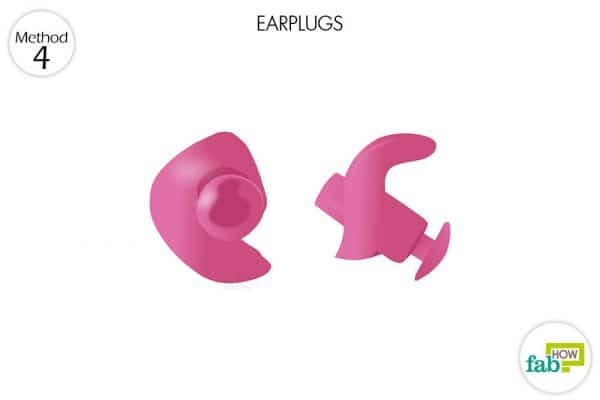 If you are a frequent swimmer, earplugs can be used as a preventive measure to stop water from entering the ear canal. Wearing earplugs whenever you go for a swim will prevent water from entering the ear canal and creating a breeding ground for infection. 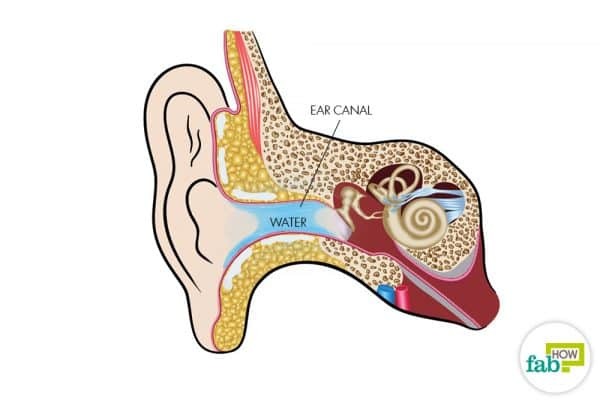 If you’re already suffering from swimmer’s ear, the earplugs will ensure that no further moisture gets in and that your ear canal remains dry allowing it to heal faster. Soak a flannel cloth in hot water. The water should be sufficiently hot but not scalding. Wring out the excess water and place the warm cloth over the affected ear. Hold it there until the heat dissipates. Soak the cloth in hot water again and reapply the warm compress until the pain subsides. Use a warm compress anytime your ear starts to hurt. You can increase the infection-fighting ability of olive oil by adding some garlic to it. Garlic contains a potent compound called allicin that has strong antibacterial properties. 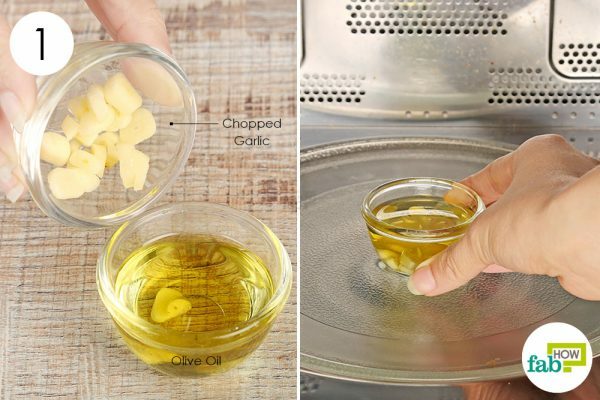 Pouring garlic-infused olive oil in the ear can help drain out the water as well as treat the infection effectively. 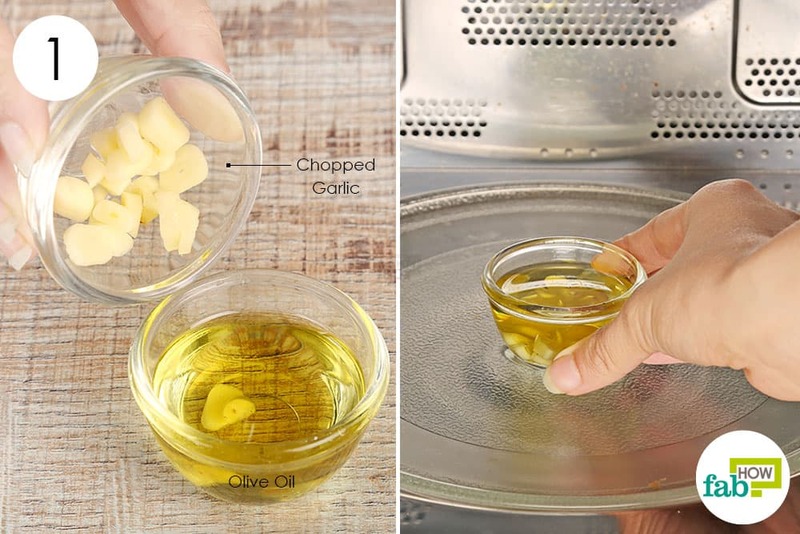 Drop 2 peeled and chopped garlic cloves into 1 tablespoon of olive oil. Microwave it on high for 2 minutes. This helps garlic’s healing properties infuse into the olive oil. 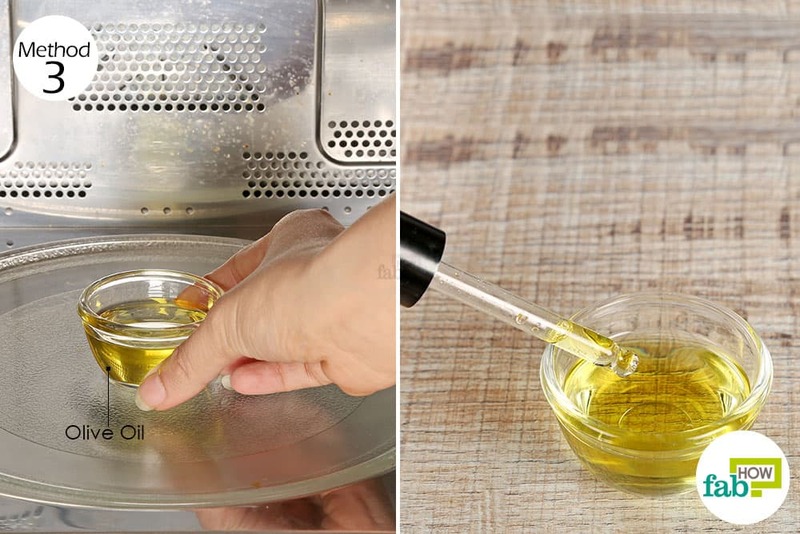 Remove it from the microwave and allow the oil to cool off completely. Lie down on your side, with the infected ear facing up. 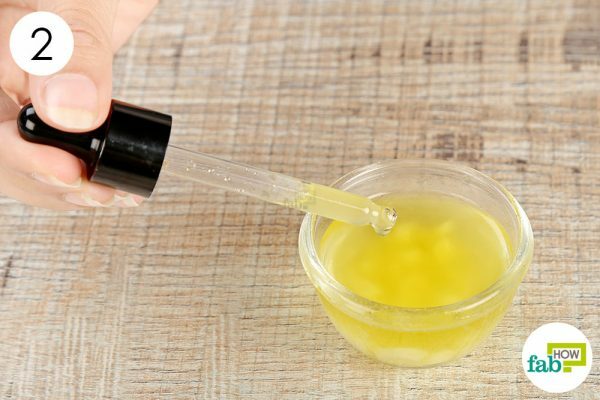 Use an eye dropper to put 2 to 4 drops of the garlic oil in the ear. Let the oil sit in the ear for a few minutes before tilting your head down to allow the oil to drain out. You can follow this with a warm compress to relieve pain. Use the oil 2 or 3 times every day for 3 to 4 days to get rid of swimmer’s ear naturally. 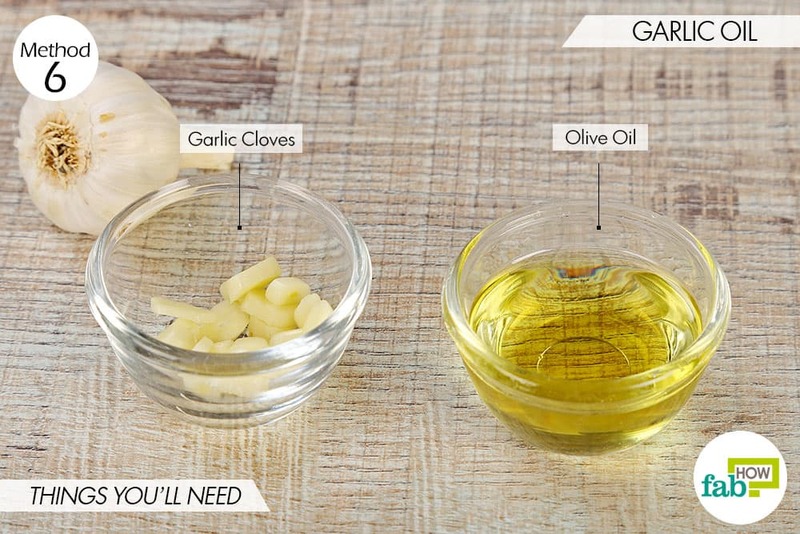 You can also make garlic oil by using an airtight container or a stovetop and store it for regular use. Yawning and chewing can help prompt fluid to drain out of your ear. Putting 2 or 3 drops of colloidal silver in the ear canal once or twice a day can also help treat swimmer’s ear. To prevent swimmer’s ear, you can use a blow-dryer on the coolest setting to dry out your ears after swimming or taking a shower. Remember to maintain a safe distance (about 18 inches from the ear) when blow-drying your ears. Keep your ears clean. You can learn how to safely remove earwax and unclog blocked ears here. 1. Otitis Externa - Swimmer's Ear. Stanford Health Care (SHC) - Stanford Medical Center. https://stanfordhealthcare.org/medical-conditions/ear-nose-and-throat/otitis-externa.html.